This week we will be thinking about concavity as it relates to making that perfect pot of coffee. In fact, since weak coffee is the opposite of good coffee, it should become immediately clear to you by now that a tablespoon of coffee should be rounded, or convex, if not level. This is not an issue of accuracy versus precision. That is to say, if you can't make proper coffee, piss off and I'll do it. Three of us will be thinking of the last time we got together IRL at a Denney's outside Springfield, Massachusetts in 1988. Oh, STFU, it was such an OMG great time! We LOLed into the wee hours, and eventually ate ourselves sober again. Two of us realized that sobriety is overrated, and gave one another that knowing glance. You know, the one that makes you look like an arthritic goat trying to remove his hat with two candelabras and a pasta strainer. Lastly, but not finally, we will be considering the picture used in this post. The title of the news story strikes me as a perfect metaphor for Western Civilization. We're all a bunch of nuts, suing ourselves due to the level of weird chemicals, hormones and societal pressures acting upon our brains. For a self-aware organ,the brain seems to be painfully (to others, mostly) unaware of it's natural ferocity. I mean this in the sense that the thing we call our self seems strongly weighted towards ironically self-destructive activities. We are left, hat in hand, pudding in hat, banana in pudding, banana pit in banana, calling a trusted friend and weeping openly about the surreality of the whole thing. I hate it, but I do it, but I hate you because you do it and that makes me better than you, but I hate myself for doing it, but I love myself for hating it, but you hate me anyway because you hate yourself hating me for knowing you're no better than I whether you actually do it or not, and even if you do do it, who cares? God cares. 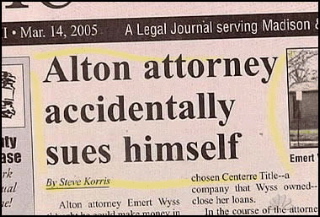 Oh, and I once managed to sue myself. Messy situation that required wire wool to clean up. On the plus side, I lost all my money in the court process! New Conservapedia:Back to the Classics?